Running a diesel engine to charge your batteries every night is a hassle. Not only that, but it disturbs the peace of a quiet mooring, and isn't a very environmentally responsible way of obtaining energy. It isn't even very good for the engine: most alternators only give a light load to a big propulsion engine which is designed to be run under much heavier loads. Solar power on the other hand is clean and quiet and reliable - and these days it's cheaper too! UniSolar adhesive backed panels are an excellent solution for a narrowboat, because they can be stuck down to the curve of the roof. They can even be walked on with soft soled shoes. In summer, one 68 Watt panel should supply all the electricity you need for lighting and water pumps. Make sure you use energy efficient lighting where possible, with LED units to give the maximum light for the minimum power. If you run a fridge, you should consider fitting two panels (or the longer 136W panel), since fridges are rather power-hungry compared to other appliances. If using it in winter, you should look to buy two or more of the 136W panels. If you leave your boat for long periods of time and just want a solar panel to keep your batteries in good condition while you are away, you can get away with a smaller panel - perhaps 50W or so. 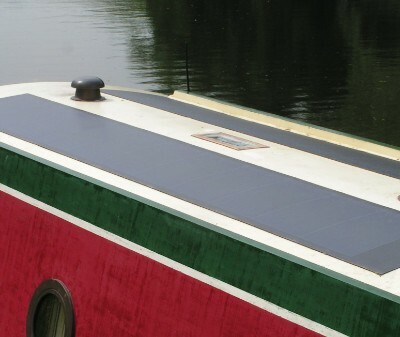 Our flexible range of solar panels can also be stuck down to the curve of a narrowboat roof. They can be mounted either using the 4 grommet holes in the panel corners, or by gluing the panels down. Framed solar panels are the best value in terms of the power output for a given price. We have a big range both of low voltage panels that can be used with cheap, simple PWM solar regulators, and higher voltage, higher power panels that are very good value but do need an MPPT regulator to optimise their power output. 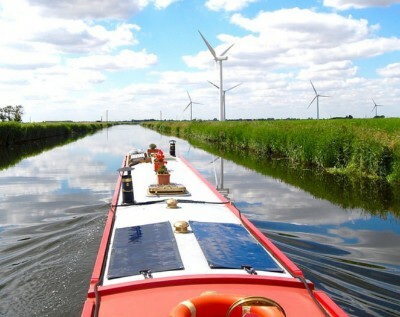 Framed solar panels are the most cost-effective way to get electricity on a narrowboat, but you will have to think carefully about how to mount them. If you want to be able to charge your engine starter battery AND your leisure battery bank, you will need to choose our solar kits with a dual solar charge controller option (available on selected solar kits only). Wind turbines can add useful power in the winter - but output can be very disappointing if there are trees or buildings around to disrupt the wind flow. They do also give some noise. Solar should always be the first choice on a narrowboat to give you maximum power for your money.